Learn how to guide students to enhance stretching by utilizing the wall at the deep end of the pool. Maximize and utilize Archimedes' Principle. 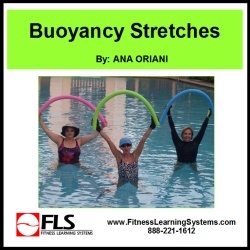 Learn the Supine/Side/Front Working Position to find proper neutral buoyancy and place the body in buoyant equilibrium. Use deep end stretches and the following practices to enhance the participant's body awareness. Learn how to modify exercises for the shallow end of the pool by using the appropriate buoyant equipment to obtain the desired stretch.